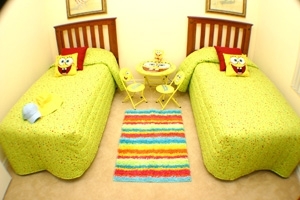 Sponge Bob Twin Bedroom ! 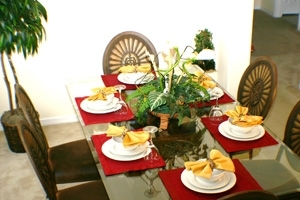 Our beautiful 3 bedroom villa is situated in the prestigious gated community of Tuscan Hills. The single storey home itself is big enough for a large family, with three good sized bedrooms and 1402 sq ft of living space, all air conditioned and furnished to a luxurious standard. You'll be able to relax around our large private 26 x 13 sq ft south facing pool, but should you wish to cool off, you can go inside the villa where all the rooms are kept at a cool and constant temperature. Alternately, just lie back and relax in our superb spa. The villa has a large living room with two large luxurious sofas (one of which can easily be pulled out and converted into a Queen sized bed) and a comfortable armchair, allowing the whole family to sit down together at the end of an action packed day. French Patio doors give direct access to the pool deck as well as providing a great view out and lots of natural light in. There is also a cooling ceiling fan to ensure that the room stays cool as you relax. To help keep everyone entertained there is a large screen Television with cable TV, a DVD system and a CD player. If you fancy escaping the sunshine for a while, this is the ideal place to come curl up and relax with a good book. The large modern fully fitted kitchen comes complete with every modern convenience, including a cooker, microwave, fridge / freezer / ice machine, dishwasher, toaster, kettle and coffee machine. There is a breakfast bar with enough seating for two people. If you need to do any laundry, you will find a large capacity washing machine, tumble drier, iron, and ironing board in the laundry cupboard. All bed linen and towels are provided for your needs. The villa has a telephone from which all local calls are free, and all other calls can be paid for using most telephone cards (sold in most large retail stores). The telephone also has a data socket giving you FREE high speed Internet access should you have your laptop. The villa has a good sized dining area which is located at the rear of the villa, adjacent to the Living room and the Kitchen. It contains a large glass topped table and six chairs, and is ideal for both formal and informal meals. As with the Living room, French Patio doors give direct access to the pool deck as well as providing a great view out and lots of natural light in. To add to your further enjoyment (should you have any spare time!!) we have converted our garage into a fun Games Room. The room features a Pool table, table tennis, and a basketball hoop. Additionally, the clubhouse at Tuscan Hills also features a Games room with a pool table, air hockey table and table football. There is also a fully equipped gym complete with a running machine, cross trainer, exercise bike and multi-gym, and outside the clubhouse is a tennis court, sand volleyball court and a children's play area. All these amenities are available for you to use at no extra cost. The villa contains three large bedrooms and a queen sized sofa bed in the Living room, allowing up to 8 adults to sleep comfortably. One of the bedrooms is a master suite, one is a queen, and the third is a twin. 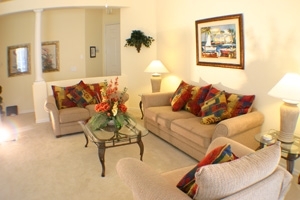 All three bedrooms have their own television with cable TV. The luxurious master suite looks out over the rear of the villa and has a fabulous King sized bed, ceiling fan and clock radio. There is also a fantastic en-suite bathroom which comes complete with a huge walk-in Shower, separate toilet, his 'n' hers basins and a large vanity mirror, whilst there is no shortage of storage space with a large walk-in closet. The second and third bedrooms are located at the front of the villa. Bedroom two has a queen sized double bed and bedroom three has two single beds. Both rooms have ample storage space provided by large built-in closets and drawers. The home's second bathroom is conveniently located directly in between these two bedrooms and contains a bath / shower unit. If you still need to squeeze in a couple more people, there is a Queen sized sofa bed located in the Living Room. 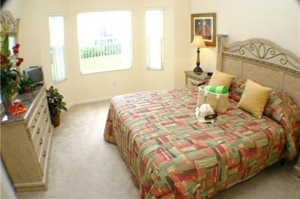 All the bedding is provided and the beds are made with clean bedding before your arrival. Extra bedding is provided should you need it. Our villa has its own private south facing 26 x 13 sq ft Swimming Pool and Spa. Being south facing has the added advantage over many other villas in that the whole pool area will be bathed in sunlight all day long. It is surrounded by a large extended paved patio and a covered lanai with a cooling ceiling fan should you prefer to sit in the shade. The deck is furnished with chairs, a table, and beach beds which allows you to just lie back, relax and enjoy the Florida sun. If you find the pool is a little cool for your liking, it can be fully heated at an additional daily charge (recommended for October to March). The pool deck is fully screened which helps to keep the pool clean and the wildlife out, and it does not affect your tan in any way. The pool is serviced weekly so you can be sure it is clean and safe to swim in. The luxurious raised Spa is a great way to relax and is able to accommodate up to four people at once. Not a bad way to discuss tomorrows adventures! For peace of mind should young children be staying at the villa, a pool safety fence is available which takes only minutes to put in place. A booking deposit of £250 is due when booking form is submitted. Balance is due 6 weeks before you depart for Florida.